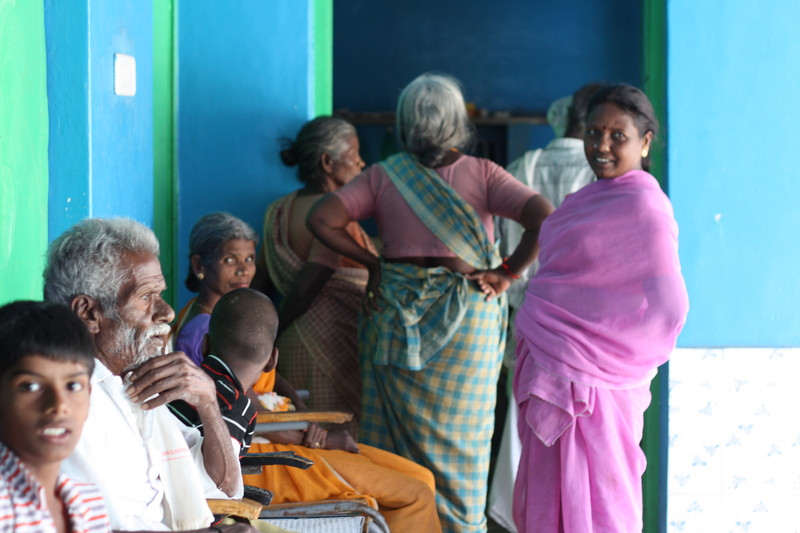 Every last Sunday of the month, Vaidyagrama hosts a “medical camp” in one of the nearby villages, offering free herbal medications and medical advice. This past weekend, we got to come along to help and to pick up what we could by observing since we certainly wouldn’t understand what was being said. We arrived around 10:00 am to set up at the village administrator’s building, which was next door to the school and the bus stop on the main road. Dr. Vasant, one of the junior doctors, was the only staff person, plus four of us students. As Dr. Vasant innocently put it, “You all have white skin, while the villagers are mostly brownish in color, so you will attract some attention.” Indeed. We began to wonder if the entertainment of seeing us may have been a bigger draw than the medical help. 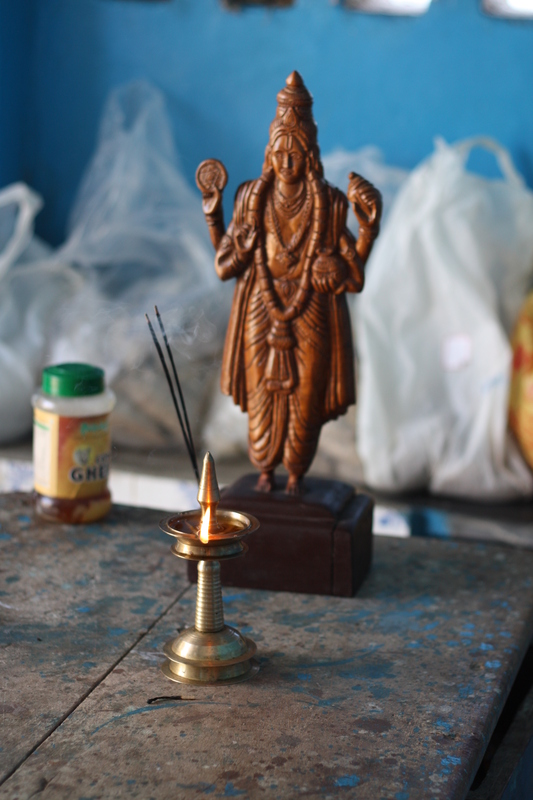 The first thing Dr. Vasant did when we arrived was to set up a sri Dhanvantari figure (the god of healing) on the table outside along with a small ghee lamp, and the village administrator lit two sticks of incense. Even here, spirit comes first. Dr. Vasant then asked us to alphabetize the bags of herbs and to familiarize ourselves with their names. He started seeing patients in the office, sending them out to us with a “prescription” for one or more herbs. The villagers tend to be manual laborers in the surrounding area, so the most common complaints were muscle and joint pain, along with some respiratory issues, colds and coughs, and a variety of bodily discharges. We took turns serving at the herb table and observing in the consult room, standing behind Dr. Vasant to try to read his patient notes, which were in English. Unfortunately, the illegibility of physician’s handwriting appears to be consistent across cultures. There was no concept of privacy. People crowded in the room while patients told the doctor their concerns, and children roamed in and out playing games. Family members sat down one after the other, with the mother collecting all the herbs at the end. I felt intrusive at first being in the office observing, but after awhile, I felt like part of the crowd just listening in. It seemed no one was concerned about sharing the details of their ailments. Ayurveda teaches that there are three main methods of assessment: observation, palpation and questioning. Questioning is certainly easiest for us novices, while observation and palpation require more training and experience. Not understanding a lick of what was being spoken provided a great opportunity to use my eyes and ears more intently. I tried to guess what the complaint was just from watching how the patients moved or their expressions. Occasionally Dr. Vasant would ask a patient to stick out his tongue, and the color or marks there would give useful information. I found myself trying to guess how old the patients were, and they were often as much as ten years younger than I thought – striking evidence of the toll their hard lives were taking on their bodies. Around lunch time, a woman came into the office whom I recognized from Vaidyagrama. She smiled at me and came over and took my hand and started to lead me wordlessly out of the room. Dr. Vasant stopped talking to a patient and explained, “She lives in this village and she is going to make us some tea and snacks – you will accompany her to her house.” If you aren’t good at going with the flow around here, you’ll get more proficient pretty quickly! Emily and Lynn came along leaving Ras at the herb table, and off we went. The woman kept hold of my hand as she led us down the street, attracting a trail of children as we went. 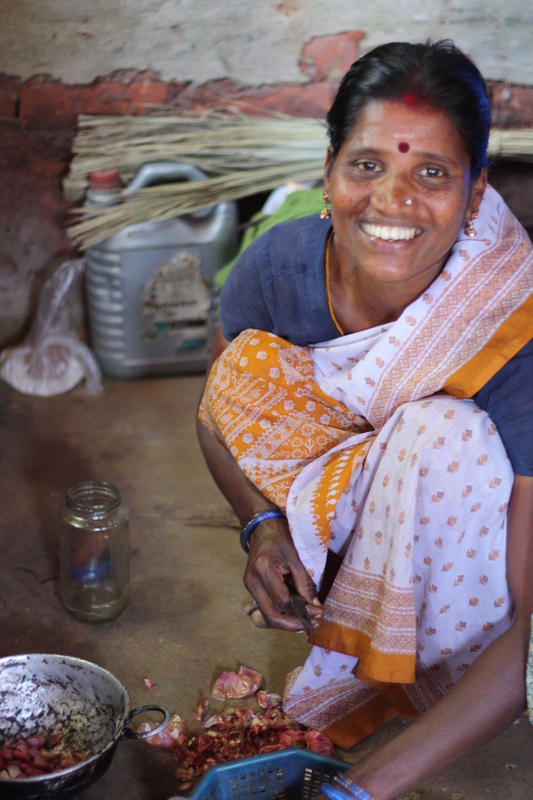 Her name was Vali, and the few words of English she knew were, “Work Vaidyagrama – garden and kitchen.” Somehow, that was enough. She led us down a small side street to her one-room house with a cement floor and corrugated metal roof. There was a boy sleeping on the bare floor when we arrived, who rolled over to the side but remained prone the entire time we were there. Vali unfurled a mat for us to sit on and then brought us three orange sodas each in a different brand bottle and some sweet snacks that appeared to be store-bought. None of us really wanted orange soda, and I remembered all the warnings about drinking from a bottle you haven’t opened yourself, but it felt too rude not to take a few sips. The children seemed to multiply around us, all smiles. Kavia was Vali’s daughter and appeared to be about 8. Emily had brought her camera, which provided unlimited entertainment. They all wanted to be in pictures with us, and then to see the picture in the digital display of the camera. Then they wanted to take the pictures. There was a lot of laughing. At one point, they turned on a TV (a remarkable thing to see in these surroundings), which we think was for our benefit, but when we ignored it to watch Vali cook, someone eventually turned it off. Lunch was amazing, all cooked on one burner with a propane tank from a squatting position on the floor. We feasted on uttapam (savory spongy pancakes) with cooked cabbage, dal curry and coconut chutney. 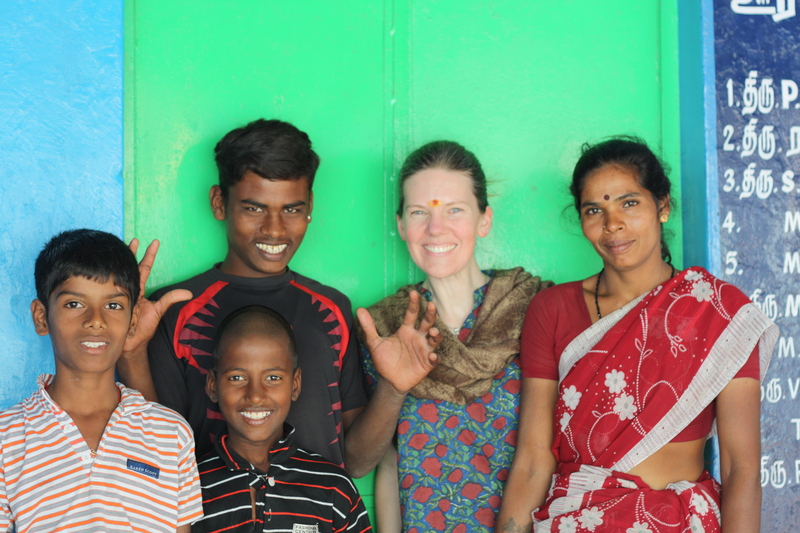 The one word of Tamil I’ve learned came in handy – “Nandri,” which means, “Thank you.” We repeated it several times. At one point, a relation of Vali’s came by who spoke a bit more English and he helped translate a few more basic facts. Vali got out four prized photographs from a weathered envelope and showed us her family – twin boys, now about 15, Rohan and Lakshman, one of whom was the sleeping boy on the floor – her relative explained that he had been working all night (in addition to going to school), thus his sleepiness. She has another boy a bit younger than the twins who we don’t think was there at that time, and then Kavia, the youngest. There was also a father evident in the photo, and the relative explained he had left when Kavia was a baby and now had a wife in another town. Vali teared up as he explained that she was the sole provider now, and then she went back to cooking. After we finished eating, Vali packed up food for Dr. Vasant and Ras and we headed back to the camp. There were no patients at that moment, so she served them both, including pouring water from a cup to rinse their hands when they were done. Then, with hugs all around, she headed back to her life – and I marveled again at how I ended up with mine. Dr. Vasant later commented, “She doesn’t own her house. Her rent is 750 rupees a month” (about $17 US). We could only guess what her income is. “Amazing hospitality, isn’t it?” Dr. Vasant said. We are still pondering what to do to thank her adequately. For the last hour of the day, it was quiet, so we got to learn more about Dr. Vasant himself. Thirty-one years old, he got married two years ago to a woman he met in school. She is a naturopath. Her parents were not enthusiastic about their marriage, because he is from a lower caste than her family. They decided to get married in secret, and then once her family warmed up to him, they had another wedding last year. He gives a very serious first impression, but his sharp sense of humor and joking streak catches you by surprise. I think he looks like a 1930’s Hollywood star. At about 3 pm, we loaded the supplies into the jeep along with the four of us and the driver, and Dr. Vasant got on his motorcycle. However, instead of heading back to Vaidyagrama, Dr. Vasant led the way into the woods. Our driver didn’t speak English, so we couldn’t ask where we were headed. 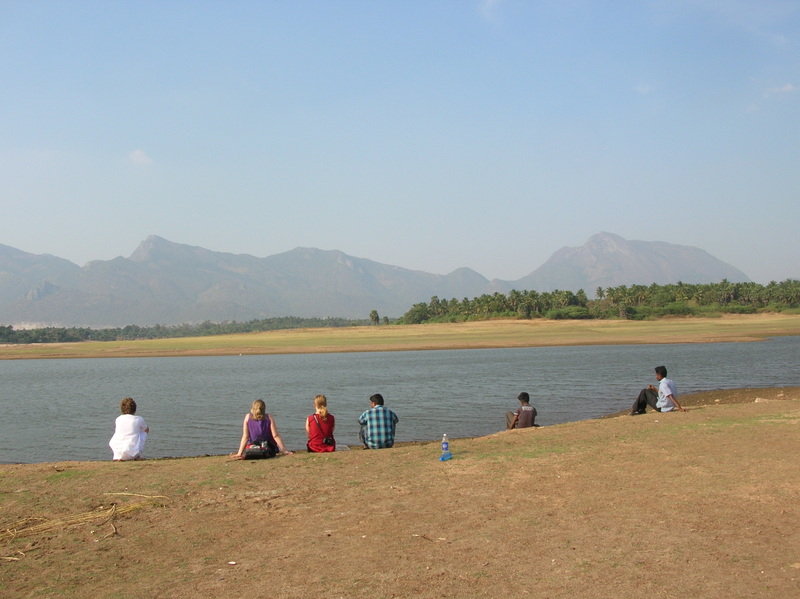 After ten minutes of winding down a rocky and increasingly impassable road, the vista opened up in front of us revealing a lake and the string of mountains we can see far in the distance from Vaidyagrama. Dr. Vasant flashed his winning smile and said, “I thought we should have a picnic,” and waved a bag of fried snacks in the air. It’s hard to know what to do with all the impressions made in just one day here….